Farm Girl Pink....: ~ Tala Kitchen wares... more pretty things to look at! ~ Tala Kitchen wares... more pretty things to look at! image from here... and it's currently for sale! I have been looking for the blue pieces and not really seeing that many of them. The jadeite green pieces seem to have been the ones that were mass produced and sold in the US. So sweet. And the lettering on it is decent shape. 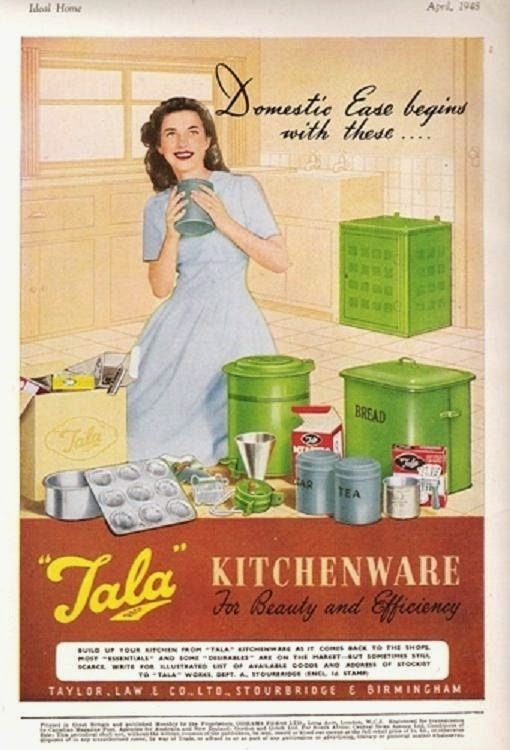 I have notice the smaller Tala kitchen tins seem to get handled so much more and fading is more pronounce. But this one still looks good considering the age of the tin. image from here.... and already sold! By the time I found these wonderful white and black Tala canisters listed.... they were sold! But I wanted to share the picture. This is such a great set of canisters... and it gives you an idea what they full set would look like. Oh my... my favorite color... yellow! This is the first time I have seen a set of Tala pastry cutters, in a yellow and white tin! image from here... and already sold! I saw this wonderful jadeite green, two tiered cake canister - tin, last week. So cute! But sadly already sold! But this Tala cake canister, shown below... is still active and will ship to the US. This one looks like it would hold a two tier cake plus a couple of pies! 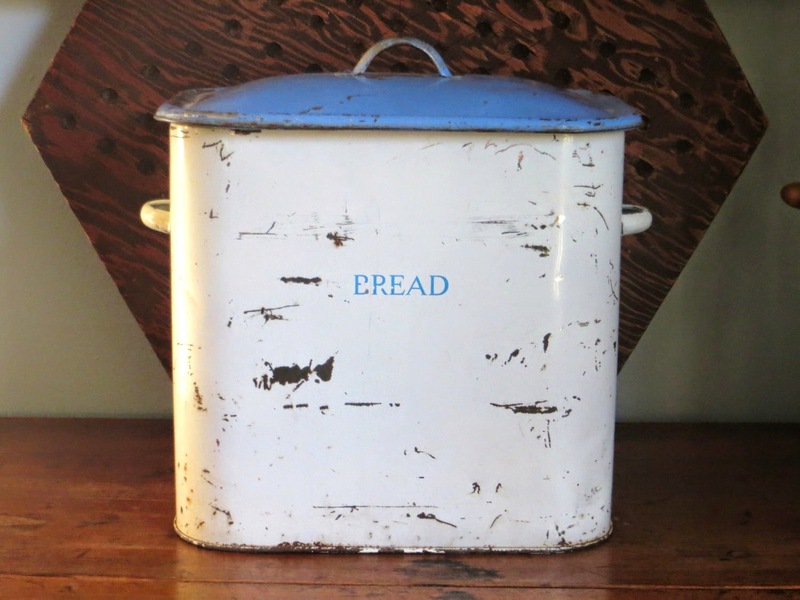 And this seller has an amazing list of kitchen enamel wares and aluminum things for sale! I spied these two green and cream enamel ware pieces... that looks suspiciously like Tala kitchen enamel wares. The top one is a drain for sponges... to sit near the sink. And the bottom one... a chamber pot! But they colored up like the other vintage Tala kitchen wares. Seriously, go look at that sellers list of goodies. There is so many good things there for sale. image from here... and for sale! What a great group. 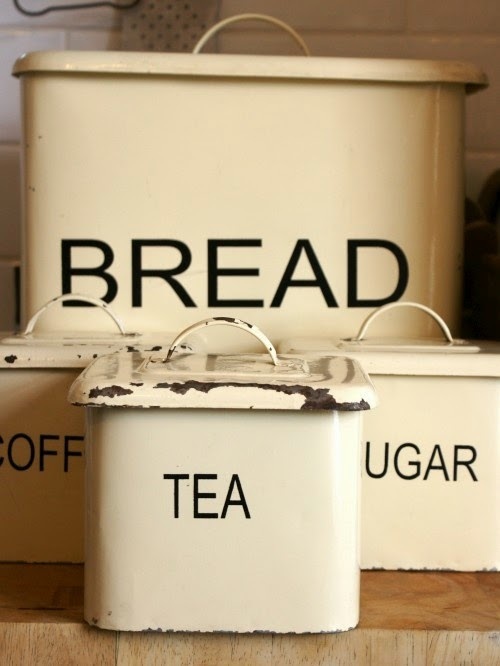 I have that cake canister in green and cream. Plus a flour and Biscuit tin. They are in excellent condition, too. I packed them away when I painted and there they still are! I wanted a change but won't let them go! There is a picture of them on top of my Hoosier at the beginning of my blog. These canisters aren't enameled and fade if they get wet and are not dried right away. Sadly a lot of the old canisters were that way and finding them in good condition is hard. My flour canister does have some wear but still good. I was wrong, my cake tin is not three tiered! Has it been that long since I looked at them? LOL In my picture, I didn't share a good photo of the biscuit tin. 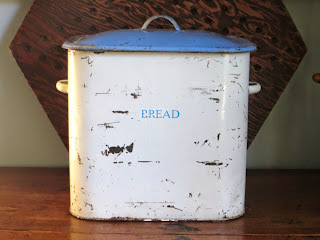 It is more like the cake tin you shared and my cake tin is more like the flour canister and is hinged. The cake and flour tin are thick but the metal of my biscuit tin is thin. Thought I should clear that up after I mentioned mine. There is so many options when looking for the Tala kitchen wares. I had been stalking that two tier cake canister. It seems like it would be easier to store. And not over whelming in size. I really like to see that three tier canister in person. I am thinking it is bigger than I realize. If you want to see a stunning set of vintage tin canisters in Red... check out that link. The look like the first cousins, of the ones made by Tala. And they have their matching metal hanging rack. They are amazing. And I suspect would be a few hundred dollars+, if found in any antique mall. Yes, I have seen that post and I LOVE those! I am sure they would go extremely high, too.